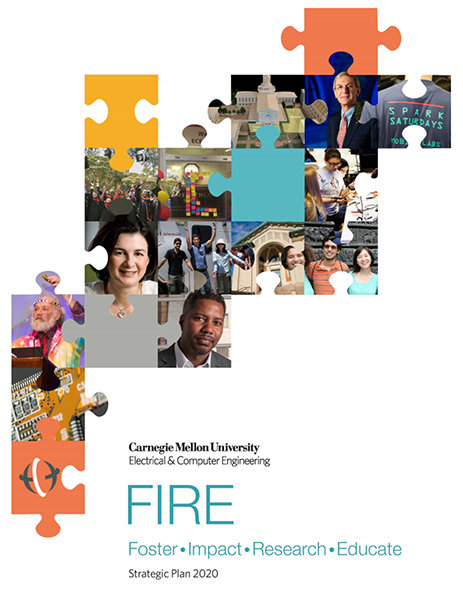 FIRE: Foster, Impact, Research, Educatepresents the strategic plan that sets the course for Carnegie Mellon University's Department of Electrical and Computer Engineering for the next five years. The plan articulates our vision and mission and maps the path for its execution. CORE VALUES.The ECE Department has been a leader in both research and education for years; it is known for its innovative qualities, boldness of ideas and unbridled enthusiasm. This plan follows in these footsteps by putting pen to paper to articulate the shared vision that will bring together all ECE people and resources. FIRE is a commitment guided by our core values to propel us even further on the road of scholarly excellence and societal impact. We value scientific truth, creativity, quality, innovation and engineering solutions, all within a diverse and inclusive community guided by respect and the joy of doing. We respect each other; this is evident by what we do, by recognizing and celebrating everyone's abilities and achievements, including respect as an end, not just as means to an end. We value a culture of inclusion and welcome diversity in people, cultures and opinions; true insight and novel solutions come from looking at challenges from different perspectives. We act with integrity; those around us can expect an open, reliable and trustworthy rapport. We aim to solve fundamental scientific and engineering problems that have a significant societal impact; to do that, we employ our creativity to generate impactful solutions and rely on our entrepreneurial spirit for wide dissemination. Our core values form the foundation for what we do. We believe in solving problems that have large societal impact. We also believe that success stems from an environment of enthusiasm and openness, respect and integrity and freedom to express and explore a variety of ideas. VISION. Our vision is our guiding light. It informs and propels us in the right direction. The strategies of how to follow that path change over time; the vision does not. To be a creative driving force, within the university and worldwide, of highest scholarly and entrepreneurial quality. MISSION. Our mission is our what, who, how. It explains what we do, who we do it for and how we do it so we engage the hearts, heads and hands of our students, faculty and staff in achieving our objectives. The strategic objectives coming out of this mission form our path forward. To inspire, educate, and produce electrical and computer engineers capable of tackling fundamental scientific problems and important societal challenges, and to do so with the highest commitment to quality, integrity, and respect for others. We aim to be the best at what we do and to apply our skills and knowledge to execute our vision. We educate students to become engineers who are sought after by industry, academia and government; we do so in an environment imbued by enthusiasm and love for what we do, with respect and willingness to listen to each other, with freedom to express our ideas and look at challenges from different points of view. We strive to be the ECE department of choice for those who are willing to step off the beaten path, for the visionaries and dreamers. We are committed to propelling ourselves to the next level along all the axes of importance: research, education, the environment in which we work and societal impact. We will do so by bringing together our students, faculty and staff, industrial and governmental partners, as well as our alumni, in forging a strategic vision and environment that promotes success.